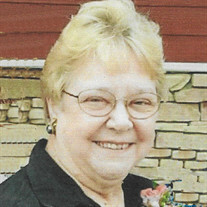 Rose A. Pruett, 74, of Warrensburg, Illinois, formerly of Brownstown, Illinois, passed away Thursday, January 17, 2019, in Memorial Medical Center, Springfield, IL. Services will be held at 11:00 AM, Monday, January 21, 2019, at Miller Funeral Home, Vandalia, IL, with Pastors Mark Smith & Brian Canaday, officiating. Burial will follow at Pilcher Cemetery, Rural Brownstown, IL. Visitation will be held from 10:00 AM to 11:00 AM, Monday, January 21, 2019, before service at Miller Funeral Home, Vandalia, IL. Memorials: To the Family. She was born January 12, 1945, in Brownstown, IL, the daughter of Glenn Oliver & Margaret Rosemary (Rush) Tackett. Rose was a retired Data Processor for A.E. Staley, Decatur, IL; Homemaker and Caregiver; and Member of New Beginnings Church of God, Decatur, IL and Four Square Church, Harristown, IL. She is survived by: Daughters - Jennifer Pruett, Warrensburg, IL and Jessica Knight & Jeremy, Decatur, IL; Grandson - Luke Knight; and Brother - David "Doug" Tackett & Donna, Bluff City, IL. Preceded in death by: Parents; and 1 Brother, James Tackett. in 2016.